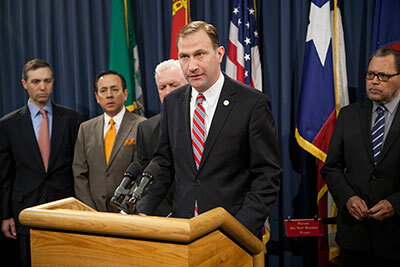 Senator Charles Schwertner of Georgetown laid out a plan to improve response to disease outbreaks in Texas. (AUSTIN) — Texas could be better prepared for an infectious disease outbreak under a bill announced Wednesday by Senate Health and Human Services Chairman Charles Schwertner. Drawing on the lessons learned from the handful of Ebola cases in Texas at the end of last summer, Schwertner said he worked with state health services to devise a plan to ensure Texas can deal with future cases of Ebola or any infectious disease that arises in the state. Though a potential outbreak was prevented, Schwertner said a number of issues were apparent in the response to the discovery last August to an active case of Ebola in Dallas. Lines of authority were unclear, there was a lack of the types of equipment needed to protect responders and health care workers from exposure, and there were concerns about the storage and transportation of contaminated waste. Schwertner's bill would permit the Governor to declare a state of infectious disease emergency and require adequate stockpiles of personal protective gear for first responders and health care workers. It would also allow quarantine orders to be enforced proactively. Under current law, the head of state health services can quarantine individuals he or she believes pose a risk to spreading an infectious disease, but that quarantine can only be enforced if a person breaks quarantine. By that point, the person may have already exposed the public to infection, so the proposed law would allow state officials to keep a person from breaking quarantine. The bill also allows the state broader power to look into how contaminated materials are stored and transported and sets guidelines for the care and testing of pets and livestock that may have been exposed to a disease. Schwertner said that his proposal will help the state get in front of any potential disease outbreak, not just Ebola. "This is reactive to what we saw in the cases of Ebola in Dallas, but proactive to address any potential emerging infectious disease threat of a serious nature in the future." 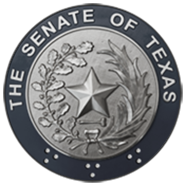 Also Wednesday, officials from the Texas Department of Transportation appeared before the Senate Transportation Committee to apologize for billing errors in TxTag, the state's automatic toll road fee system and promised to fix the problems. Thirty-thousand Texas drivers were sent bills in the mail when they had active TxTag accounts and three and a half million invoices were sent out to drivers months or even years after they should have been billed. Jon Barton, Deputy Executive Director at TxDOT told the committee that customers would have late charges waived and would not be assessed penalties or be obligated to pay additional bill assessments. He added that his agency is working with Xerox, who runs the TxTag system, to increase manpower to better address complaints and lower wait times on calls on customer service lines. Committee Chairman Robert Nichols of Jacksonville requested weekly reports on hold times, manpower levels and number of complaints until the problems surrounding the TxTag billing system are resolved. The Senate will reconvene Tuesday, February 17 10:30 a.m.